Sarah Leckie Hogencamp joined the faculty of Asbury University in 2013 after 10 years of traveling the world as a documentary filmmaker. She traveled to more than 30 countries with One Mission Society as well as ran her own production company on the side. 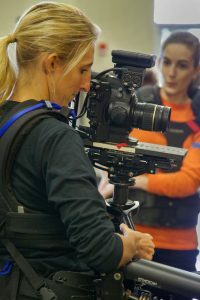 Sarah currently teaches Cinematography, Underwater Cinematography, Documentary Filmmaking, Editing, After Effects, Writing for the Media, and Faith, Media and Calling. Sarah has taken students to South America to shoot a documentaries, Russia and Rio to create news packages at the Olympics for LEX18, Florida to shoot under water films and Utah to participate in the Sundance Film Festival. Sarah has won various awards as well as nominated for Emmys. DP for Faith, Love and Chocolate. DP for Nazareth. Anson Williams director. Producer. Lucid Arts Concert Series.